This Asian Wonton Salad is delicious with a sweet sesame dressing and homemade Wonton crisps! After indulging in Fat Tuesday food this week, I think we all may need to detox. 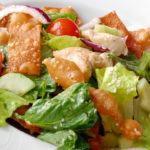 Here is an exceptionally delicious salad, using the Sweet Sesame Dressing posted yesterday, that will get you started. 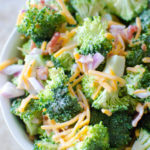 I love love love this salad! It was fun to make the wonton crisps homemade, but you can also find them at the grocery store. Seriously, though, you should definitely try to make these yourself as they are not at all hard and worth every crispy little bite! Do not let the frying step scare you away. It only takes a small amount of oil and very little time. Ben really enjoyed this salad, as well. I had it again the next night and craved more of it today! 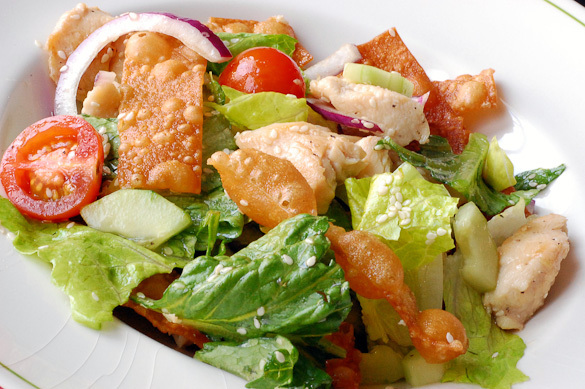 The succulent dressing will leave you licking your plate clean! Heat about 1 inch of oil in a pot on the stove top to 375˚F. Using a pizza cutter or sharp knife, cut the wonton wrappers into thirds (3 strips). Test the oil by dipping in a wonton strip. If it bubbles quickly, it is ready. Fry the wontons a few at a time, only a few seconds each, and drain on paper towels. They can be made ahead of time and kept in an air tight container. 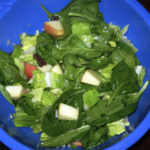 Tear clean lettuce into chunks and place in a large salad bowl. 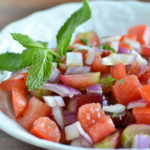 Top with tomatoes, cucumber and onion. Add the chicken, then toss with Sweet Sesame Dressing. Once salad is combined, add wonton strips and gently toss to combine. I love wonton chips in my salad! Mmm, wonton chips are great! And your salad dressing sounds delish. I love this idea! You could also crunch up some ramen noodles and add them to the salad for extra crunch! Hmm… these looks so refreshing. 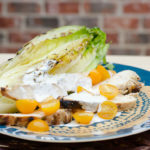 I’ll have to try the dressing sometimes for a little variation on my salad! Oh how fabulous! This looks so light and refreshing after all the heavy dishes of winter. excellent. i couldn’t find the wonton wrappers, so i made the dough myself using this recipe: http://chinesefood.about.com/od/dimsumwonton/r/wontonwrapper.htm. and i deep fried them in my gran-pappy. they were really good. the dressing is key.